Step One: Tear a piece of newspaper up into small pieces as shown above. Try and find a piece of newspaper that has text on both sides of the paper. Step Two: Paste the newspaper onto the chipboard letter. Place the newspaper pieces onto the letter in a random pattern with the text running in various directions. Step Three: Turn the chipboard letter over and add some adhesive to the sides. Fold the newspaper over the sides and cut away any excess pieces. Step Four: Turn the Chipboard letter right side up again and lightly sand the edges with a sanding block to smooth them. Step Five A: You have several options to finish your letters off. The first and easiest option is to ink the edges. You could ink them lightly or heavily as I have done for a more dramatic look. Step Five B.1: Another option is to first ink the edges and then add some acrylic paint to your letter. In keeping with the recycling theme, use items like toilet paper rolls to stamp onto your letters. Step Five B.2: For a more distressed painted finish add a layer of Ranger Rock Candy crackle paint. Step Five C.1: Another option to finish off your letters is to age your letters for a vintage look. Start by inking your newspaper covered letter with some Ranger Vintage photo distress ink. Then ink the edges with some Walnut Stain distress ink. Step Five C.2: Now add a layer of extra thick gel medium to the entire surface of your letter. For added texture you could tap your finger on the gel to create some peaks. Set aside to dry. Step Five C.3: Once the gel medium has dried completely you can add some more ink and perhaps some metallic paints to the letter for a really aged finish. The gel medium on the letter above was smoothed over before it dried. Step Five C.4: For the letter above I created a far more textured surface with the gel medium but tapping it with my finger. This is a really lovely finish and definitely my personal favourite of the options I’ve demonstrated. Depending on your personal style, there are dozens of options to finish your letters. You could dip your covered letters into some clear UTEE, stamp and emboss over the newspaper text or maybe even mist them. Not only is this a fun technique to use to embellish your chipboard lettering but also a great way of keeping up with the latest trend of scripted text on papers without having to fork out a lot of money. Wonderful tutorial Wendy!!! Soooo many options you gave on how to finish off the letters:) Pinning this to share and bookmark....I know I will refer back time and time again....cuz it's that good!!!!!! One thing I learned from my parents and grandparents is to use what is at hand to make what I needed. 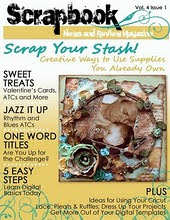 I really like using scraps and this is marvelous. I have chipboard letters and couldn't think of even one fun thing to do with . To me this tutorial is fun. I have enjoyed your 5,6 and 8 petal flowers from scratch. Your site is a treasure trove. PS I joined your site and hope you will visit me and join.